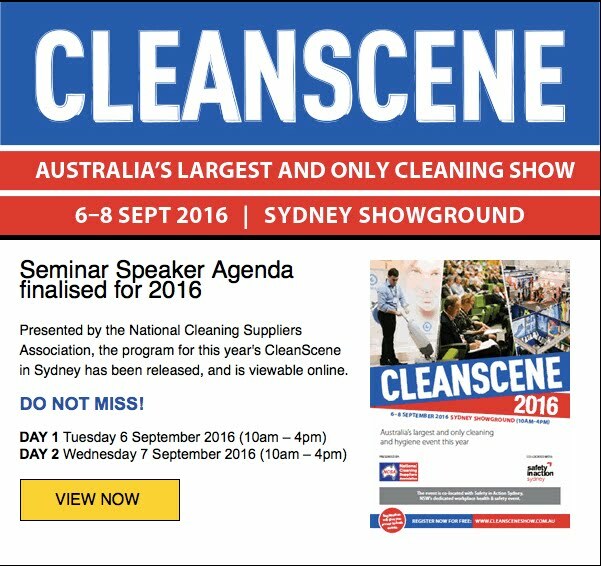 Cleanscene 2016 was held in Sydney at Homebush Showground Facility over September 6,7 & 8th, again in co-location with the Safety in Action Show. Despite attendances being slightly down for both shows by comparison to previous events, the morning sessions were extremely busy, with all exhibitors expressing very favourable comments about the quality of people attending the show, and the enquiries forthcoming from those attendees. There was a good mix of exhibitors across many facets of the Cleaning Industry, from Chemicals to Machines, Software Systems, Importation Companies etc. as well as local Distributors. There were a number of International Exhibitors offering opportunities from Manufacturing through Importation, Finished Goods and various Ranges of product to mention a few. The quality of stands and presentation was of a very high level once again. Seminar attendances were seen to be very well supported and covered a wide variety of topics. One highly attended Seminar was the one presented by Stuart Nicol , NCSA National President and Dianna Steinbach from ISSA, who covered the recent agreement between the two organisations to merge, following approaches by the NCSA over recent months and subsequent visit by ISSA Executive Director, John Barrett, in order to commence proceedings to allow that to take place. Both parties expressed how beneficial this new plan would be to members and what it would bring to the table for the Industry as a whole over the coming years. This has proven to be one of the most effective and popular decisions made recently and has had overwhelming support from the Industry. It should, and will, allow the much sort after unification of Industry Exhibitions, with ISSA becoming the driving force along similar lines seen with shows overseas that ISSA run. The first of these may even be as soon as May 2017 in Melbourne pending the outcome of current discussions with the current organisers of that show. The new organisation will be known as ISSA Oceania. Further details on all of the above will be announced as they become official. Innovative Product Steam- E for its Escalator Cleaner. The NCSA and Show organisers wish to congratulate the winners for their attainment of these awards. The program for this year's CleanScene in Sydney has been released, and is viewable online. 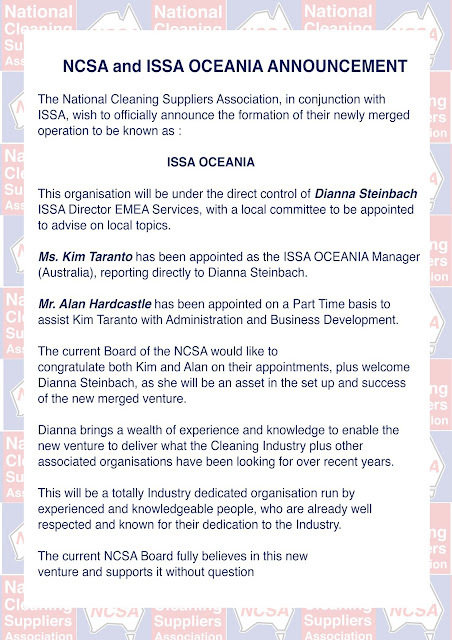 NCSA has decided to merge the association as a regional subgroup of ISSA, the worldwide cleaning industry association. This means that NCSA members would retain their NCSA membership on a local level, and it would now be expanded to include a global ISSA membership and benefits offering. Why has NCSA made this change? NCSA relies on volunteer leadership to manage the association and provide continuing benefits, which limits its ability to grow value for members and exhibition participants. NCSA currently provides an annual trade show “Cleanscene” in conjunction with the Safety Show,plus it co-ordinates local events such as golf days and luncheons offering networking opportunities. With its current resources, NCSA is not able to support these initiatives as fully as it would like to. ISSA has more than 7,000 members worldwide, more than 2,200 of which are distributors. It hosts the largest and most prominent exhibitions in the global cleaning industry, and it has a strong support staff of association management, exhibition, and industry resource experts. By joining with ISSA, NCSA members gains access to the expanded network and strong staff to help NCSA grow, the events it hosts, and the benefits it offers. ISSA also would install a local staff member to ensure proper attention to the Australian market. Will NCSA continue to have its own exhibition? Yes. The NCSA exhibitions in Melbourne and Sydney would continue to exist. In fact, it is anticipated that these events will grow because of the merger. Will NCSA continue to have its other events? networking, and business tools available to its members. What specific benefits does ISSA make available to NCSA members? - Access to promotional items such as the ISSA member logo and Power of Clean video. - Member registration and networking during ISSA/INTERCLEAN® shows in North America, Amsterdam, Latin America, and Istanbul. - Member discounts on all educational resources in the ISSA Professional Development Center, including a variety of distributor sales guides and customer training tools. - ISSA’s Cleaning Industry Training Standard (CITS), which can third-party verify your training programs and much more. The National Cleaning Suppliers Association (NCSA) and ISSA have announced that NCSA members voted to merge with ISSA, the leading trade association for the global cleaning industry. Under terms of the agreement, NCSA members will retain their NCSA memberships on a local level, but those memberships will expand to include global ISSA membership and benefits. Once the merger is finalized, NCSA members will have access to ISSA member benefits, including market exposure, networking opportunities, business tools and data, and industry information. The NCSA is the leading trade association providing support to manufactures, distributors, and suppliers of cleaning and associated products in the Australian market. Having recently celebrated its 40th anniversary, the NCSA is proud to have been working hard to promote the cleaning industry and its members for more than four decades. For more information, visit www.ncsa.org.au. With more than 7,000 members including distributors, manufacturers, manufacturer representatives, building service contractors, in-house service providers, and associated service members, ISSA is the leading trade association for the cleaning industry worldwide. The association is committed to helping its members change the way the world views cleaning by providing its members with the business tools they need to promote cleaning as an investment in human health, the environment, and an improved bottom line. For more information on ISSA, visit www.issa.com or call 800-225-4772 (North America) or 847-982-0800. The association is headquartered in Northbrook, IL, USA, with regional offices in Mainz, Germany, and Shanghai, China. For more information, visit www.issa.com, follow ISSA on social media at www.facebook.com/issaworldwideand www.twitter.com/issaworldwide, or join the discussion in ISSA—The Worldwide Cleaning Industry Association LinkedIn group at www.issa.com/linkedin.